In college my grade in physics was forgettable, so when I set out to understand just exactly we had on our shelves for springs, it became quite a project. We started off with a simple premise. How close really are the aftermarket versions we’re carrying for 9-3 replacement springs to what SAAB is now selling for the same suspension codes? We used the top three varieties of replacement spring and put them to the test: 9-3 with standard suspension and manual transmission (SAAB OE 93190594), 9-3 with a standard suspension and an automatic transmission (SAAB OE 93190595) and a 9-3 with a sport suspension package (SAAB OE 93190608). In order to fully understand the results you first have to delve into the mystery of what a coil spring is, and what it does in the system of your car’s suspension. A coil spring starts off as straight wire, which is heated, wrapped around a mold, and then tempered. The wire, based on a variety of factors, has an elastic tendency (or desire) to return to its original (coiled) shape when stretched or compressed. The force that a spring exerts is static as it stretches and compresses is a constant rate. That theory is called Hooke’s Law. Hooke’s law states that the force that a spring exerts is constant until it’s elastic limit is reached – basically the spring has been completely straightened or the spring has been completely compressed, commonly called bound – at which point the spring rate approaches infinity. What this means for us is that, for the most part, a spring exerts the same amount of force for each inch it is compressed or extended or better translated it holds the same amount of weight. 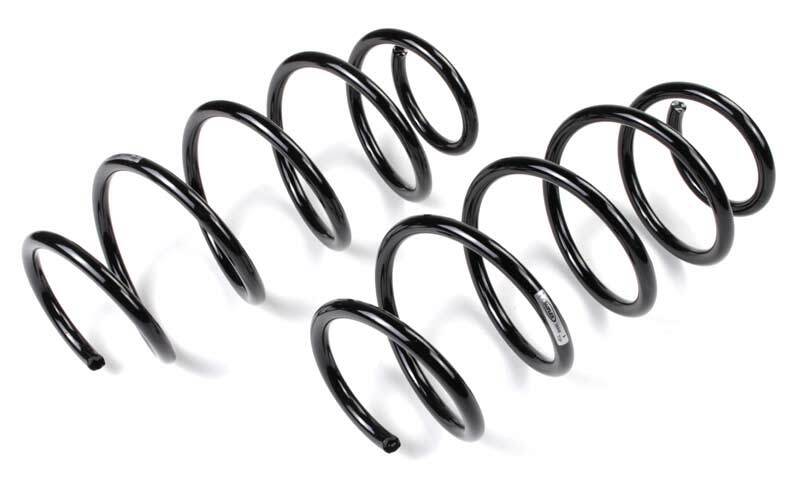 Most of the springs in our cars now are actually progressive, which means that the spring rate is less to start and increases slightly as the spring compresses. For the purposes of this exercise we more or less ignore the progressive changes because the springs are so close in rate. So where are we finally with our 9-3 front springs? What we found is that the our current “aftermarket” varieties are very close to the “new” original versions. Additionally the “rates” are so close as to be essentially interchangeable. The only significant difference is that the “Sport” springs are 1.25 inches shorter than the stock non-sport versions. This will probably ultimately result in a drop of .75-1 in on your front end when paired with the correct shocks. See below for complete information. All springs were tested for rate between the 2nd and 3rd inch of compression. Stay tuned for Pt. 2, where we take a look at differences in aftermarket performance springs designed for sport use and lowered ride height. I agree with your findings of initial spring rates and ride heights for aftermarket springs. When new, they seem to be almost identical to their OEM counterparts. I’ve found is that in the harsh New England weather, aftermarket springs rust more quickly than OEM, and break at the rust spot. Can you comment on the thickness or quality of the paint on these aftermarket alternatives versus SAAB OEM? Has this been done for the Saab 9-5 also? We are currently on the hunt for more OEM style aftermarket replacement springs for the 9-5, but right now we don’t have anything to compare to but Genuine SAAB to Genuine SAAB. If we do compare these together, that would be involved in a separate test. In Wisconsin, our roads are a disastrous mess of potholes and repairs. My ’04 9-3 Arc handles great, but it rides like a brick. Is there a spring and shock combination that can give my car a less jarring ride? Something less sporty, more like a luxury car ride? New Base/Linear springs will give you the most comfortable ride and also highest ground clearance. This test was to test the rates between OEM and Aftermarket, which we found to be very similar, and worth it to buy quality aftermarket options over OEM, which are costly and becoming harder to source. Also take into consideration that your tire size also greatly effects ride quality, you may want to try a smaller rim, larger tire option, like a 16″ wheel. It should be noted that springs sag with age, and even if your car was originally a non-aero, non-sport model, old sagging springs will cause changes in the quality of the suspension ride.